Nathan obtained his B.A. from Covenant College in Lookout Mountain, Georgia and his J.D. from the University of Tennessee College of Law. While in law school, he clerked for the Honorable Federal District Court Judge James Jarvis as well as for the U.S. Attorney's Office for the Eastern District of Tennessee and rounded out his law school time working at the Plaintiff's firm Butler Vines & Babb in Knoxville, Tennessee. While in undergraduate school and law school, Nathan served as a staff Sergeant in the Tennessee Air National Guard 134th security forces squadron out of McGhee Tyson air base in Knoxville Tennessee. While in the guard, Nathan received the Enlisted Association of the National Guard of Tennessee scholarship, was a security police academy squad leader, ground defense school platoon leader, and was a member of (1) the governor's task force on drug eradication, (2) the Ocoee River Olympics security detail, and (3) a Vice Presidential security detail. Upon graduation, he and his wife Noel moved to Tacoma, where he worked first for a land use and commercial real estate development firm and then for six years with the real estate litigation and transaction firm McFerran, Burns & Stovall. Nathan's practice focus includes, but is not limited to, real estate transaction and litigation, construction disputes and business/creditor rights collection and judgment enforcement. Nathan was selected to Super Lawyers by his peers in 2005 and 2015, named as a Washington State Rising Star in the area of real estate. 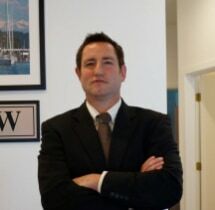 He presently owns and operates Gig Harbor Law in Gig Harbor, Washington and lives in Gig Harbor with his wife and their four boys.